In a series of talks that took place within the COP24 summit in Katowice, Poland, defenders of the circular economy highlighted the importance of including mining of rare earth metals into their discussions. Based on a research document focused on the Netherlands and prepared by consulting and venture building firm Metabolic, the experts agreed that resources are the missing link in the climate debate. In their view, this is a mistake because rare earth metals are needed to build enough solar panels and wind turbines to meet the Paris Climate Agreement targets. In detail, the report found that achieving such goals requires major inputs of iron and steel for the foundation and shaft of wind turbines. At the same time, elements such as silicon, copper, lead, and zinc are needed. However, their supply is more or less guaranteed given that they have been used in large quantities for decades. 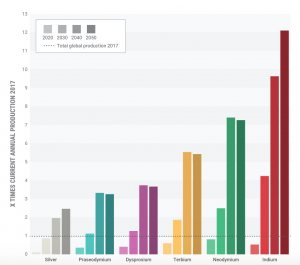 Other metals, such as neodymium, terbium, indium, dysprosium, and praseodymium, would need to be mined in larger quantities and production would need to grow as much as 12-fold by 2050 compared to today’s output. Annual global critical metal demand for wind and PV, between 2020 and 2050, compared with the annual metal production index (2017 = 1). Graph by Metabolic. Besides being key components of wind turbine and solar technologies, these metals are used in electronic equipment like hard drives, loudspeakers, and LCD-screens. Neodymium, for example, is used for permanent magnets in wind turbines and in electric vehicles. Using the Netherlands’ demand as a case study, the document states that the country will have about 1.2 million electric cars in 2030, resulting in an average demand of 100,000 electric cars per year. 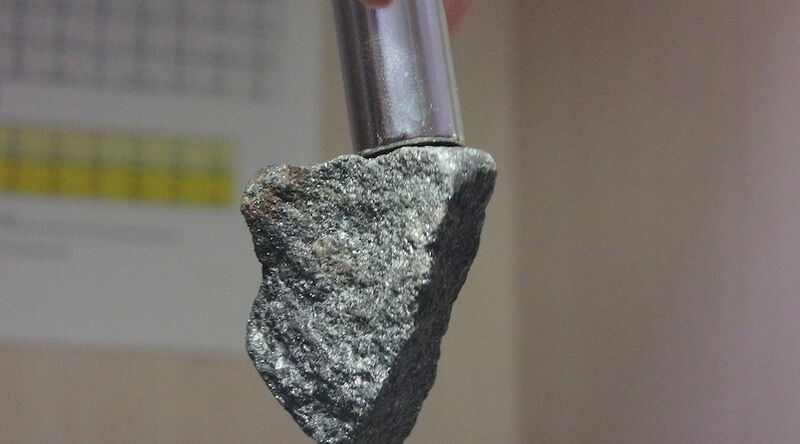 With a neodymium demand of 1.46 kg per car, the result is a total demand of 146 tonnes per year. In other words, the Dutch demand for neodymium – only related to the energy transition – would amount to 4% of the global annual production. Just focusing on electric vehicles, Metabolic expects total lithium and cobalt demand to increase by a factor of 25 towards 2050. Keeping these forecasts in mind, the consultancy proposes the idea of developing a European mining industry, given that the continent is almost completely dependent on foreign supply of critical metals, despite the fact that it hosts some reserves. The report also suggests enabling the production of renewable electricity with a smaller demand for critical metals and increasing circular design and recycling efforts by embedding circular design principles into the production of wind turbines and PV panels, to enable future reuse of components and materials at end-of-life.